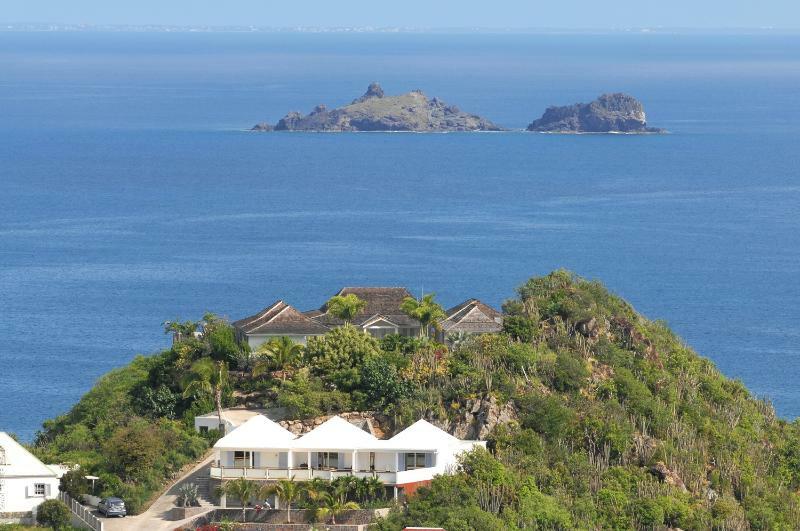 Looking out from an exceptionally high vantage point over Flamands Bay and a vast expanse of the blue Atlantic, Villa MIA on St Barts offers the ideal balance between indulgent luxury and relaxed Caribbean style. 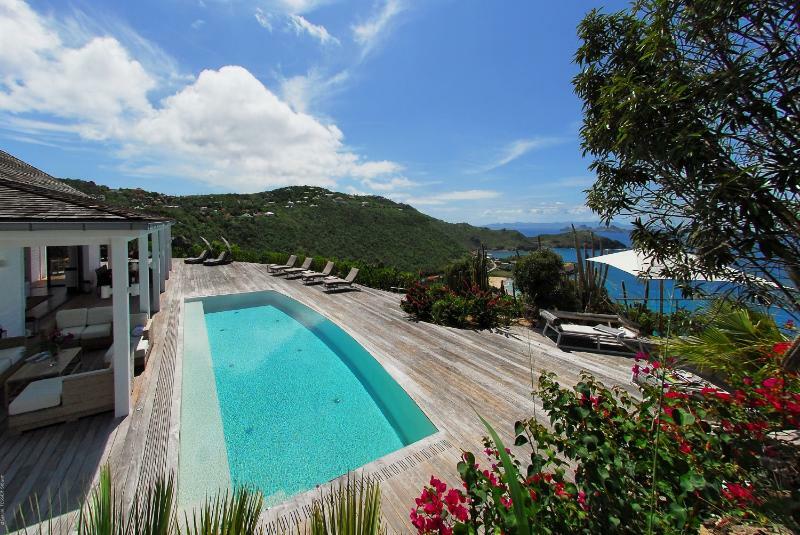 Thanks to its elevation, this property enjoys full sun throughout the day and also affords its guests an unparalleled sea view with St. Maarten and Anguilla visible in the distance. 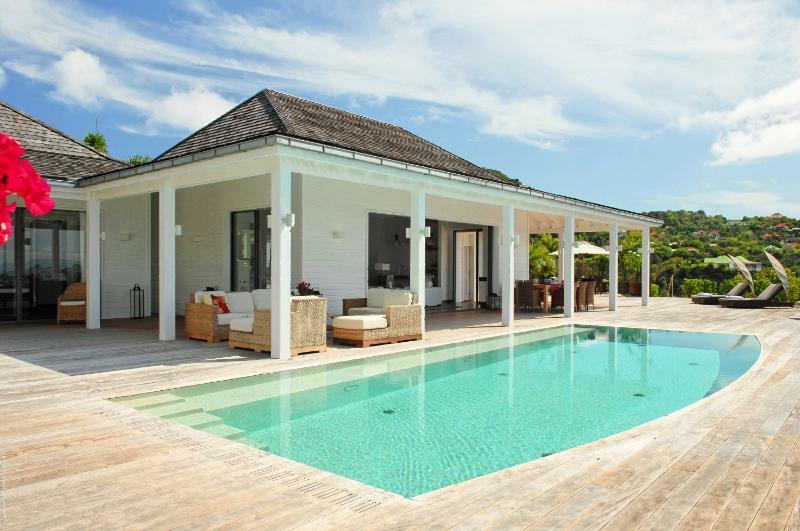 Villa MIA is laid out in a classic West Indies style, with a broad and shady colonnade running the length of the deck, providing a respite from the sun and a perfect place to relax with a book and a cool drink. The living area is open to the view, the terrace and the refreshing pool, and the kitchen is open and convenient to the sheltered outdoor dining area. Villa MIA's bedrooms open onto the property's picturesque manicured lawn and gardens of blooming red bougainvillea and swaying palms. Each has its own private ensuite bathroom, and each is decorated in a sophisticated but laid-back style that makes guests feel right at home. Design touches like soft ambient lighting, rain-head showers and mahogany four-poster beds give Villa MIA a warm and charming personality that is sure to make this one of the islands most sought-after vacation homes. Additional amenities include: air conditioning - bedrooms, housekeeper(s), private, TV - satellite, pool person, gardener.